What size first aid kit do I need? The Evolution British Standard Compliant Comprehensive Catering First Aid Point has been designed for use in higher risk catering and food handling environments where "Blue" safety items are required. It includes a First Aid Kit, an Emergency Eyewash Kit and a Burns Kit which are essential in any catering environment. The First Aid Point helps you comply with British Standard requirements for workplace and provides the necessary content in case of a casualty. 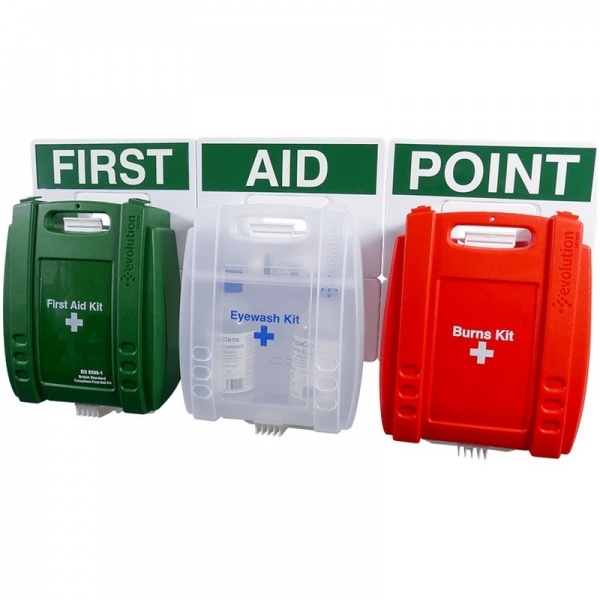 The first aid point comes fully stocked, with unique brackets to ensure kits are securely fixed to the wall, bracket labels to identify when a kit has been removed and photo luminescent bracket headers for easy identification of kits location even in dark or smoky conditions. Inside the kits, the adjustable shelves allow flexible storage and ensure contents remain in place when kit is opened on the wall. The brackets allow the kit to be opened and used as a workbench against the wall which makes it ideal for all rapid response situations. The bracket also allows the First Aid Kit, the Emergency Eyewash Kit and the Burns Kit to be removed easily depending on the need which makes them easy to transport to any casualty. 'The contents of first aid containers should be examined frequently and restocked soon after use. Sufficient supplies should be held in stock on site'. In recognising the need to ensure that current workplace first aid provision is adequate and appropriate The British Healthcare Trade Association worked with the British Standards Institute (BSI), to create a British Standard for first aid kits in the workplace. These enhanced kits are referred to by the Health & Safety Executive (HSE) in their latest First Aid at Work - Guidance on Regulations. The HSE states that 'Employees may wish to refer to Britsh Standard BS 8599 which provides further information on the contents of Workplace First Aid Kits'. The contents of these kits take into account more modern and functional products encompassing a wider range of common workplace risks and are therefore more comprehensive than the previous HSE compliant kits. BS 8599-1 is the standard that sets the new minimum level that workplace first aid kits should conform to. The BS 8599-1 standards give recommendations on the amount and size of the first aid kits necessary for the different workplace environments based on the category of risk and number of employees in the workplace. Should the risk or numbers of employees deem it necessary the minimum contents as set out in the standard can be supplemented by additional items appropriate to the hazards identified by the risk assessment. This may result for example in increasing the number of burn dressings where a significant risk of a burn injury is likely. The size of the kit required is dependent on a combination of the level of risk and the number of employees in the workplace. The table below provides guidance for employees but does not replace the requirement to carry out a risk assessment. This table is for guidance only and each workplace needs to evaluate its own level of risk. Special circumstances also need to be considered such as remoteness from medical services, special hazards such as the use of hydrofluoric acid and sites with several buildings. In these situations there may need to be more first aid kits than set out in the table.